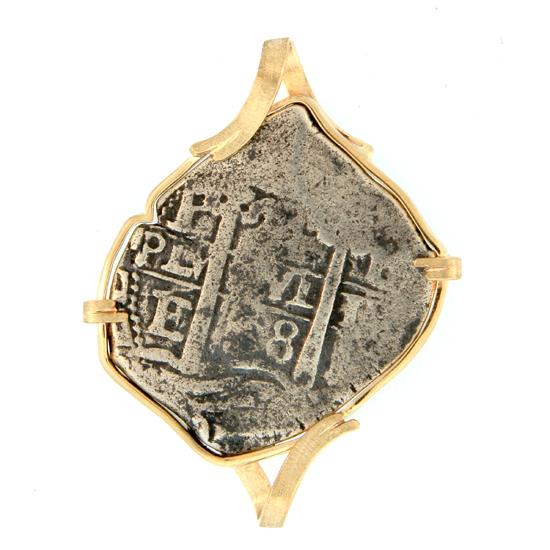 4 Reales Spanish Silver Cob Pendant from the Piedmont of the "Lyme Bay Wrecks". Sank 1795 off the South coast of England. 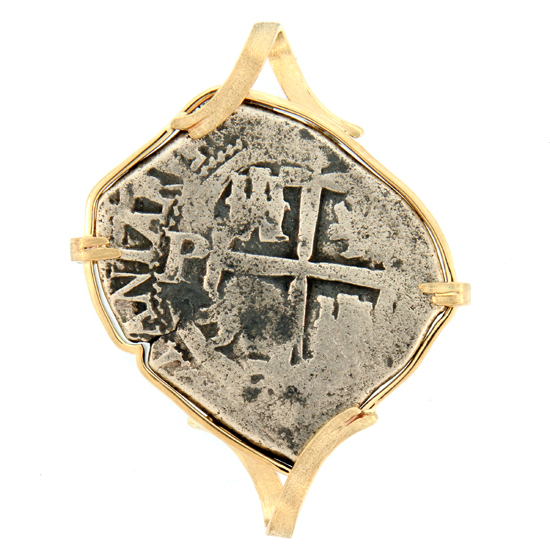 Salvaged in the 1980s Coin is dated 1678. One of a huge fleet of 300 ships on their way to the west Indies to suppress a French uprising, the Piedmont was forced into Lyme Bay during a Hurricane on November18, 1795, that sank and scattered the ships of the fleet all along the Dorset coast. The Piedmont and five other ships- Aeolus, Catherine, golden Grove, Thomas and Venus - broke apart on Chesil Beach and came to be known collectively as the "Lyme Bay wrecks". An estimated 1000 men lost their lives in the disaster, including well over a hundred from the Piedmont. alone. In the early 1980s, the wrecks were salvaged by divers Selwym Williams and Les and Julia C. Kent, who discovered many silver cobs of the late 1600s on the wrecksite of the Piedmont. 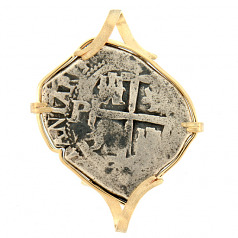 It is presumed that the coins had been captured or recovered from a 17th-century wreck and stored in the vaults of the Bank of England for about a century before being transported and susequently lost again. These coins are usually recognizable by their uniformly dark-gray coloration, a bit sea-worn but not overly corroded. A significant group of extremely rae Columbian silver cobs from the Piedmont (but not identified as such) was offered at auction in 1995. Dimensions- Coin: 1-1/4" x 1-1/4' Pendant: 1-3/4" x 1-3/8"